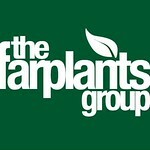 The Farplants Group is the largest wholesale supplier of outdoor plants to Garden Centres and Garden Centre chains in the UK. Based on the West Sussex coast near Chichester, the co-operative group has five member nurseries, each specialising in different ranges. From small beginnings in 1972, the group now produces over 11 million plants a year on 70 hectares (170 acres) of mixed facilities with a retail value of over £50 million. Up to 500 staff are employed during the peak gardening period through the Spring and early Summer.